From Division III action from the University of Wisconsin Stevens Point to the prep sports and everything in between, there are plenty sports to enjoy from the stands. 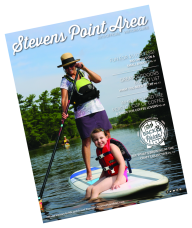 Get in the action and find your inner athlete in the Stevens Point Area. Hit the trail for the Midwest’s premier non-competitive walking marathon, Walk Wisconsin. Head outdoors in the winter and prepare for a fun run with a twist at the Stevens Point Brewery’s Bock Run. Or, hit the water for the annual PaddleQuest event where canoeing meets Comic-Con (with a side of conservation).